Here’s a band that’s kind of fallen off the radar recently. Unless you’re in the right groups, you probably haven’t heard much, if any, of their last two albums. And for good reason: they’re widely regarded as the band’s worst. Dystopia, however, brings the band right back into the sound that you know and recognize from the 80s and 90s. 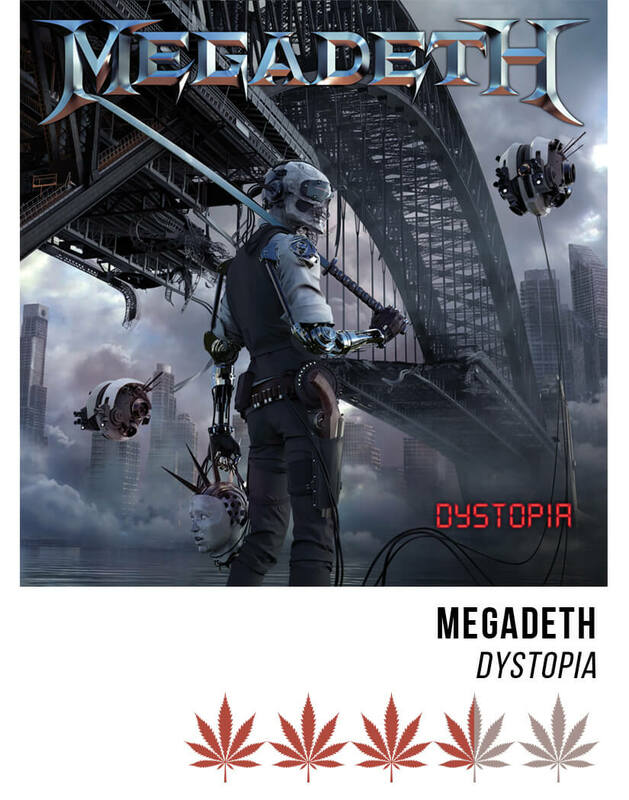 I was a little nervous about playing this album after their last two flops, but immediately after starting The Threat Is Real, the only thought that ran through my head was, “Yup, that’s Megadeth”. They’re one of those bands with an unmistakable sound; you can hear a quick, two second clip and you just know who it is. The fast, aficionado style guitar interspersed with occasional wailing riffs and the relentlessly heavy drum beats all overlaid with Dave Mustaine’s signature growl are a dead giveaway and are reassuringly familiar in Dystopia. The album’s lyrics unsurprisingly follow a dystopian theme, yet they’re cryptic enough to leave you thinking about each song long after it ends. I always want to know what an artist was thinking when they wrote their songs, and Megadeth leaves enough of a puzzle to solve that it keeps me curious, trying to dig for more context behind each song that I hear. Several songs give you a false start as you think that the album will take a turn towards some softer instrumentals, or at least vocals, before punching you in the face with more thrash. It’s a little jarring, but it fits with the overall feeling of unease and distrust throughout the album. Before you can fully recover, you get sucked into the amazingly complex guitar riffs which, despite moving at a million miles an hour, are startlingly mesmerizing. I know that smoking weed and listening to thrash metal don’t generally go hand-in-hand, but I’d recommend giving it a shot. If nothing else, it’ll give you a deep respect for Megadeth’s impressive technical skills. Every time I think that I’m over it, the instrumentals find another way to blow my mind. So much of the popular music that I hear now leaves me wondering if there’s really a band backing the singer or not. Monotonous drum beats that add literally nothing to the mix and simple guitar and bass riffs which could easily be mastered by a first year student are sadly becoming more and more popular. And that’s coming from someone who legitimately enjoys minimalism in music. The catch is that for that style to really work, each beat of the drum and each strum of the cords has to actually mean something, not just act as a filler noise. Dystopia is on the opposite end of that spectrum. There’s seldom a moment where the instrumentals take a pause, but it all comes together to contribute to the feeling that the album is trying to reach. Even if you don’t like Megadeth’s style, and I wouldn’t blame you for that, there’s no denying their talent. I give this album 3.5 stars. It’ll never be my go-to smoking album, but I’ll definitely keep in mind for when I really need to get energized quickly. Curious about what it looks like to be a stoner in Ireland? No, probably not. After all, why would you be?